On the Real Techniques website they promise that these brushes are ultra soft, easy to clean and are long lasting. They also say that there will be no product build up in the brushes and that they apply makeup with no streaks and leave a flawless finish. 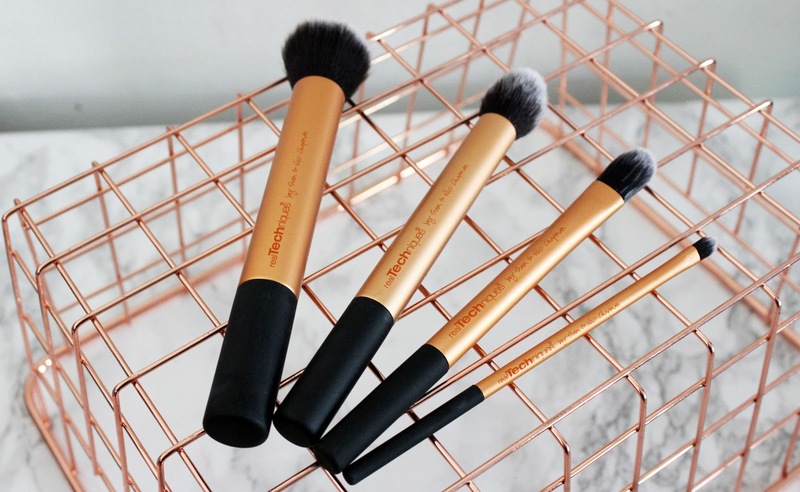 These brushes have 100% synthetic bristles so these brushes are 100% cruelty free. The brush handles are made of aluminum and are color coded, gold for face, pink for cheeks, and purple for eyes. The Handles also have the brush names on the back. Ulta has stopped caring the core collection but you can still find it for $17.99 at Target and Walmart. And you can find it for $18 on the Real Techniques website. It's also available for £16.49 at Boots. Here is my experience with the Real Techniques Core Collection Brush Set. I've had these brushes for about 2 years and I love them! The bristles are so soft and very well made. I've washed them at least 10 times and they still look and feel brand new! They shape right back to their original shape and look great. The photos in this post were taken last week! The handles are aluminum which makes these brushes very light. The end of the handles are a hard plastic which makes the brushes evenly weighted. I use these brushes all the time! They are my go to face brushes! And as promised there is very little product build up! I wash my brushes once a week to keep everything sanitary but there is never much build up and the come clean very fast! These brushes will hold up very well as long as you wash your brushes by holding them bristles facing down so the water can't get the the glue! So let's talk about each brush. Real Techniques describes this brushes as "The contour brush delicately applies highlighter to the cheekbones for a sheer, soft-focus contour." I love this brush for blush. RT says it's perfect for highlighter. It's perfect for blush too! It's the perfect size for the apples of the cheeks and to sweep a line of blush back to on the cheekbones! Real Techniques describes this brush as "The pointed foundation brush has an unique cut for use with liquid foundation to build custom coverage." I love this brush to apply concealer. It's the perfect shape for under the eyes. Sometimes I use to for powder to set my concealer instead. I love the way these brushes apply powder! Real Techniques describes this brush as "The detailer brush has a precision cut to effortlessly conceal problem areas; or, use with lipstick for long-lasting shape and definition." I use this brush to apply shadow in the corners of my eyes or to apply concealer/foundation around my lips. Depending on what in need when the brush is clean. Real Techniques describes this brush as "The buffing brushes is ideal for full coverage application of powder and mineral foundation"
This brush is amazing for foundation! It buffs out the foundation great and leaves a smooth finish! I love this case. It's a 2-in-1 stand and case but I only use it for a case. It can fit more brushes than just what's in the set and has a strap for easy carrying. RT just re-vamped the whole line and now the case is light grey and has rounded edges. It's so pretty. I wish I had the new one but the old case is still nice. Was it worth the hype? Every beauty vlogger I watched talked about RT brushes and they were right too! These brushes are amazing! Was it worth the price? I really think that it is. 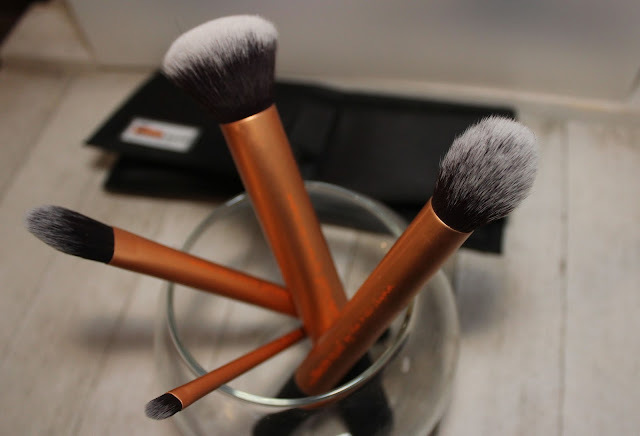 They are only $18 for 4 brushes and a case and they are such a great quality! These brushes are soft and very well made. They wash out easy and always go back to there shape. They apply product beautifully and never fail to impress! That's it for this review. Thanks so much for giving it a read! I hope you enjoyed! Have you tried Real Techniques brushes? What did you think? Let me know your thoughts in the comments below!